While a lot has changed over the years with Microsoft Dynamics 365 for Sales (formerly Dynamics 365 CRM), there’s one thing that’s been a consistent feature of the software. We’re talking, of course, about plug-ins. What is a plug-in? Simply put, a Dynamics plug-in is a custom business logic that’s triggered by an event in Dynamics 365 CRM. For example, creating a new account triggers a customer plug-in which then executes further processes within Dynamics 365. 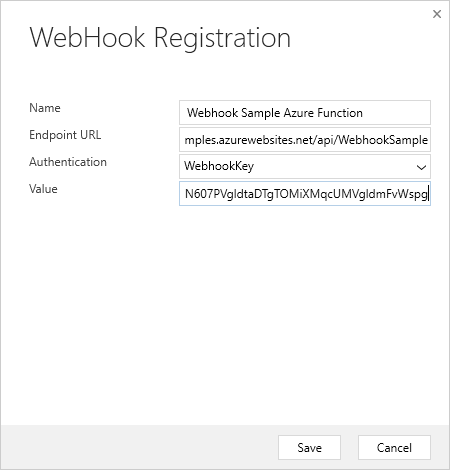 Thanks to the introduction of configurable webhooks in Dynamics 365 CRM 9.0, it’s now possible to create a webhook -- similar to the process of configuring a plug-in -- which is subsequently executed within an Azure Function. This can be helpful when you encounter plug-in limitations, or if you want to use a plug-in for further integration. In this blog, we’ll show you exactly how to write a Dynamics 365 CRM plugin in Azure Functions. If you’re not familiar with Dynamics plug-ins, you can read more about Dynamics 365 CRM plug-ins here. If you want to learn more about webhooks, click here. 1. 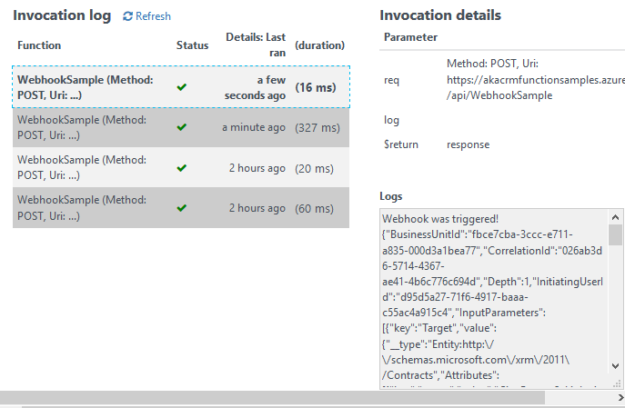 Integrations: If you want to separate integration logic from the Dynamics 365 CRM code base, you’ll need to use a webhook in order to implement this logic outside of CRM. You can also run into various complexities when attempting to work with existing .NET assemblies to facilitate integration with an outside system. This can result in complicated plug-in code. Webhooks allow you to avoid these various pitfalls. So, how do you set them up? First off, you’ll need to create a service that uses the incoming webhook request from Dynamics 365 CRM. Then, you’ll need a second webhook step within Dynamics 365. This is configurable using the Plug-in Registration Tool. Let’s look at an example. Here, we’re working with Visual Studio 2017 with the Azure Development workload installed. 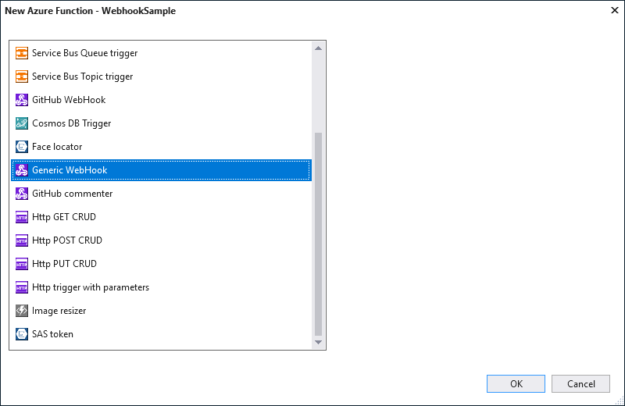 This allows us to code Azure FUnctions directly into Visual Studio. 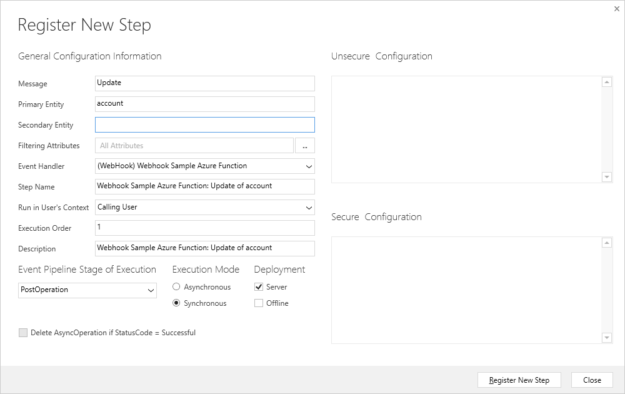 Now, deploy the function to your Azure Function app. Take note of the function’s URL and key. 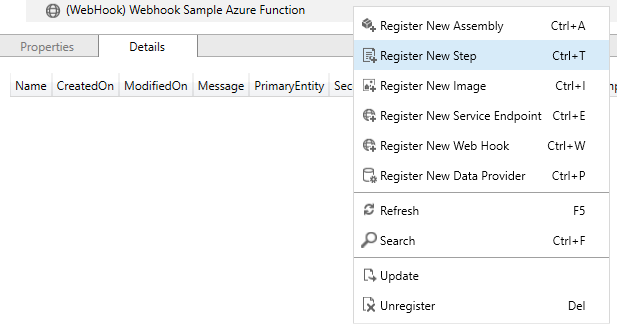 Browse to the Function App within Azure Portal, choose your function, and use the “Get Function URL” feature next to the Run button. Use the key in order to get the URL. Next up, you’ll want to open the Plug-in Registration Tool and connect to your organization. Click here to download the tool. Note that the webhook here is set to execute whenever a change to an account record is detected within Dynamics 365 CRM. Next, you’ll need to click “Register New Step.” Then, be sure to confirm that your webhook and steps have been successfully registered. 1) First, modify an existing account record within Dynamics 365 CRM. 2) Then, check the Azure Function’s log within Azure Portal. Here, you should be able to see a log message which contains the JSON that was sent to Azure from Dynamics 365. 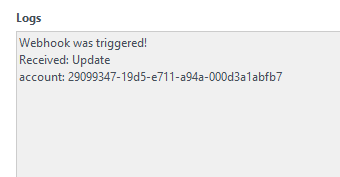 If you can’t see this log message, then Dynamics CRM isn’t properly triggering the associated Azure function. At this point, you have a significant amount of JSON information coming from Dynamics 365. The question arises, then: how should you make use of this data? Here, you’ll want to use the DataContractJsonSerializer to turn the JSON into a RemoteExecutionContext. If you’re a plug-in developer, this context object will look quite familiar to you. This object can be used inside your new Azure function. Now, it’s time to deploy your new code, update another Dynamics 365 CRM account, and check your logs again. At this point, the log should show both an updated account ID as well as a confirmation that the webhook itself was triggered. Done! You now have the ability to take the context of a Dynamics 365 CRM event and pass it directly to an external webhook service without using any code within Dynamics 365 itself. This is huge. 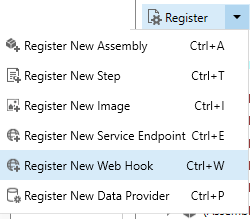 And, as we’ve seen, all you had to do within Dynamics 365 was register the webhook and link it to an event in the 365 event pipeline using the Plug-in Registration Tool. 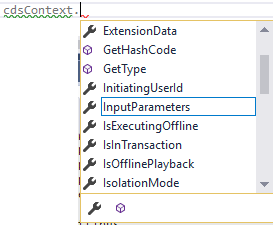 In addition, it’s possible to interact with the context you’ve created the same way that you would if you were using a native Dynamics 365 plug-in -- that is, by deserializing the context to a RemoteExecutionObject. As you can see, implementing Dynamics 365 solutions isn’t always easy. Are you struggling to make Dynamics 365 CRM work for your organization? If so, AKA Enterprise Solutions can help. Contact us today to speak with one of our Dynamics 365 experts. Part 2 – User Adoption with Microsoft CRM/Dynamics 365. Do you have it? Are your Sales Reps Behaving? That all works, good explanation but can you give a example if I want to update a field value after changing it back to CRM? For example after getting the phone no from account entity I formated the phone no and update the field with new value? ?